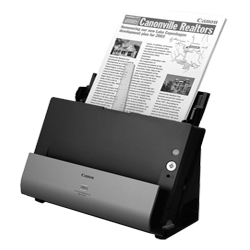 Canon DR C-125 Scanner Built compact without comprising speed or quality with a minimalist design achieved through the elimination of obstructive tray extensions.The DR-C125 is capable of high-speed 1-pass duplex scanning at 25 sheets per minute.The built-in ultrasonic sensor accurately detects when more than one sheet is fed simultaneously and can prevent important information from being left out. The upright design and U-turn path, which requires no additional space for document ejection, provide the ultimate in space saving performance. Scan a variety of documents with the two available ejection paths. Use the U-turn path to scan and eject standard-paper documents or business cards without consuming additional space in front of the scanner. You can switch to the straight ejection path with a simple flip of a lever to scan thick document sheets, driver's licenses and ID cards. Scans up to 25 pages per minute (in black and white, grayscale, and color). Scan directly to cloud applications such as Microsoft SharePoint and Evernote. Single-click image quality adjustments with Full Auto Mode.